Yeah, but: It's not so remarkable anymore. 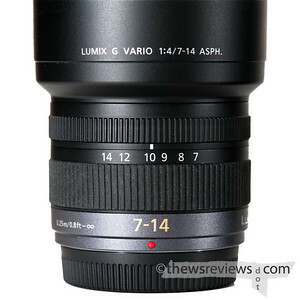 The Long Version: The Panasonic 7-14, aka Lumix G Vario 7-14mm f/4.0, is a little lens with big shoes to fill. It's the second lens with those specifications, following up on the immensely capable Olympus 7-14, which I reviewed almost eighteen months ago; I've also written up a brief head-to-head comparison. But I realize that a lot of people who are coming to micro four thirds are completely new to the format, so I've been trying to evaluate this lens on its own merits, and review it without referencing its bigger brother. Naturally, that attempt was completely doomed. 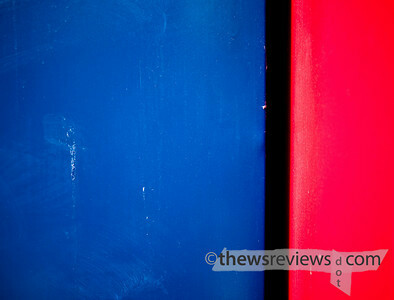 I've been surprised to find some significant differences in how I use the Panasonic lens compared to my previous experience with the Olympus; whether this reflects a different character of the lens or my own changing tastes, I can't yet decide. So while I won't be able to write this without referencing the larger Zuiko Digital Olympus lens, I also won't just be rehashing what's already been said. 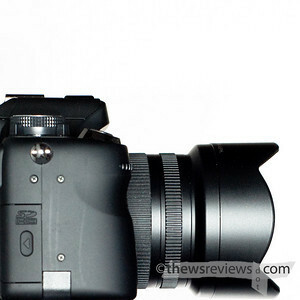 The most striking thing about the Panasonic 7-14mm is that it's tiny. 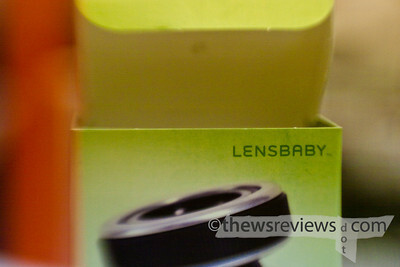 Not much larger than its 14-45 sibling, its mostly-plastic construction and lens cap makes it a very manageable lens. Shooting with it is easy, and it doesn't overwhelm even the petite Olympus E-PL1, which is currently the smallest camera that it will work with. In my direct comparison, its size stood out as the biggest difference between it and the Olympus 7-14, and that carries over into using it. The Olympus is a large, intimidating thing with a bulging front; the Panasonic is just little and easy to get along with. Carrying it and bringing the camera up to shoot is a casual move that won't scare the locals, and yet the field of view is nothing short of amazing. It can see wider than a right-angle corner, create huge perspective changes, and still fit in a jacket pocket when it's not being used. Even though being this wide is no longer quite as remarkable as it once was, it's one of the very few lenses that can do that. 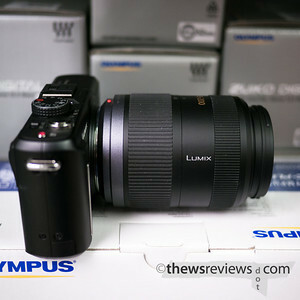 Optically, the Panasonic lens is stunning, with excellent central sharpness and corners that aren't far behind. 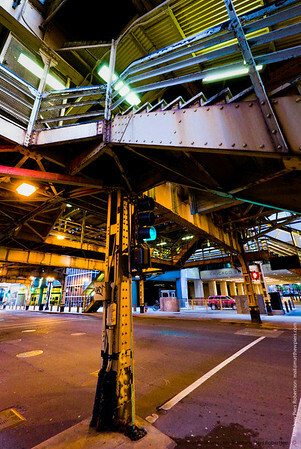 The photo of Chicago's Michigan Avenue is wide open at f/4.0, and there's not much to criticize. But forget about getting blurry backgrounds with this one, unless you're working at very short distances - it's just not possible. But then, this isn't exactly a portrait lens, and if you expect to use it like a standard zoom you're either unusually gifted or unusually dense. Ultra-wide angle lenses need special handling, and they're not going to reward casual or unconsidered efforts. A couple of feet, when seen at 7mm, looks like a couple of metres. If there's nothing there, the photo will suffer badly. Similarly, the perspective effects from tilting the camera, or being askew of the subject, will dramatically change the arrangement of lines. With care this can be used for a powerful creative effect, and can create leading lines and dynamic compositions out of mundane backgrounds. But all it takes is a moment of carelessness, of absorption in the subject and neglect of the edges, and the result is a write-off. Thankfully, Photoshop has some powerful transform tools, because the electronic viewfinders and LCDs of the micro four thirds system aren't nearly as nuanced as a good optical viewfinder. Of course, the dramatic perspective effect is true for all wide-angle lenses, and it doesn't need to be at its widest setting to be a challenge. 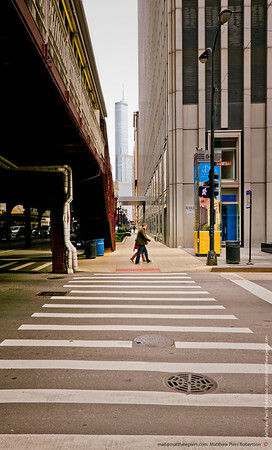 The photo above, looking across Chicago's East Adams street, is modestly cropped after being shot at 13mm. I happen to like the image, but I know exactly what my camera club buddies would say: the people are the subject, and they take up a tiny part of the picture space. But if it was shot with a more normal lens, like the 20/1.7 or a zoom that's been brought in tight, the photo would just be of some people in a city. I say that the subject of the photo is the vanishing point that's so alluring beckoning with its single-point perspective, and what you'll see when you get there - unless, like the people walking past, you choose to defy it. Having elaborate justifications for taking photos that most people would delete on sight becomes an important part of enjoying this lens. One of the real strengths of the Olympus 7-14 is its extremely low barrel distortion, and the Panasonic is even better. Except at its extreme ends, the electronic correction of the m4/3 format works its magic and leaves nice straight lines. Some reports haven't been happy with chromatic aberration, but since this is something that Panasonic corrects while Olympus cameras do not, it's impossible for me to know why different reviewers are having different reactions to the lens. I tend not to shoot trees against the sky, which causes colour replacement, or bright against dark, which causes purple fringing, both of which are easily mistaken for or called chromatic aberration. Regardless, don't believe half of what you read on the internet, and trust even less than that - present company included - until you have a good reason to do otherwise. One issue that I have with the Panasonic 7-14 is flare. It wasn't something that I was particularly aware of with the Olympus 7-14, but it's in a number of the Panasonic photos. I don't find it outright objectionable, but if it wasn't there I wouldn't be trying to add it in Photoshop. Granted, the conditions in the photo above are pretty harsh - a similar situation even made the 20/1.7 flare - but the look comes out ugly. 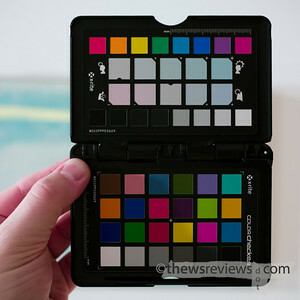 (See also the little rainbow dots in first sample photo in the body of the review.) I've also learned to occasionally take a few moments to make certain that the front element is clean and dust-free, as little specks can cause flare spots in any sort of contra-light situation. The hood is vestigial, and there's not much that can be done to shade the front element, but I stand by my observation that the Olympus 7-14 is better. 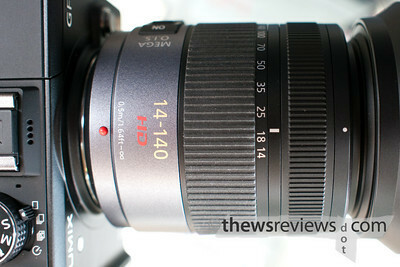 I mentioned in my preamble that I use the Panasonic 7-14 differently than my Olympus lens. Because I know that the Panasonic only distorts - however slightly - at its two ends, I'm much more likely to use it throughout its range. With the Olympus lens, which performed very similarly throughout, it might as well have been bolted to its 7mm setting. Mouse over the photos to see their exposure information, but so far only one has been at 7mm, three are at 8mm, and the rest have been longer than that. 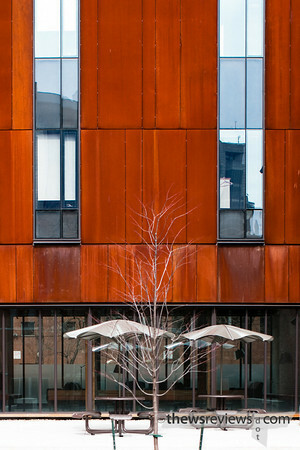 Some of them have also been cropped, which effectively increases their focal length as well. A popular comparison will be with the Olympus 9-18mm, and the question is going to be whether the Panasonic lens is worth the extra cost for 'only' two extra millimetres on the wide end. As with any question involving the concepts of 'need' and 'cost', the answer must be a personal one, but I can say that I'm very happy with my choice. First of all, even assuming that two 2x zoom lenses with a thousand dollar price difference will be of equal optical quality, not using the very ends of a zoom's range is just good hygiene. So even if I'm happy at 9mm, that doesn't make the Olympus 9-18 a better choice, it simply makes it acceptable. Secondly, at these extremely wide angles, a 2mm difference in focal length makes a very large difference in the field of view. The relationships between the foreground and background can completely change just by moving the camera and zooming a little to recompose. I'll admit that the 36mm-equivalent focal length of the 9-18 is very useful, but life's a barter. I want to be able to go wide, and this lens was always part of my plan when I shifted most of my 'fun' equipment from Olympus to Panasonic. When I compared the Panasonic and Olympus 7-14 lenses - gratuitously linked again - I had to stop and consider the competition. When the Oly came out, there was nothing else like it available - except for the Sigma 12-24 DG on a full-frame camera, which was hardly anyone's ideal solution. But with the passage of just a few years, the others have nearly all caught up. The Olympus 7-14 was once an excellent reason to buy a Four-Thirds camera, but now it's not that special any more. The Panasonic 7-14 suffers a similar fate, but has the unique advantage of being far smaller than all of its rivals. So that brings us to the argument that sustains the entire Micro Four Thirds system, of being smaller and lighter, with just-as-good image quality. If that's important to you, and you want wider than the Olympus 9-18 can offer, then this is your lens. I can highly recommend it on the GH1, with its ability to change the image aspect ratio without sacrificing field-of-view, but if a squarer format is your preference, there's a lot of great cameras to choose from. While Sony and Samsung - two companies without SLR sales to cannibalize - are making their way into the EVIL market, they're both a long way from having the horsepower to match the micro 4/3 lens lineup. 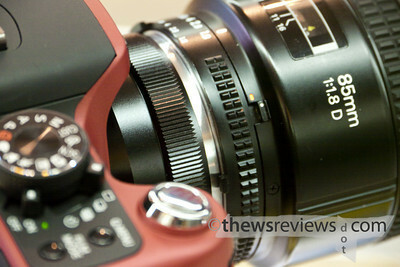 If history is anything to go by, the Panasonic 7-14 may have another year or two of exclusivity. Until then it's unquestionably the best ultrawide in its weight category, even if it's not the slam-dunk recommendation that the Olympus 7-14 once was. 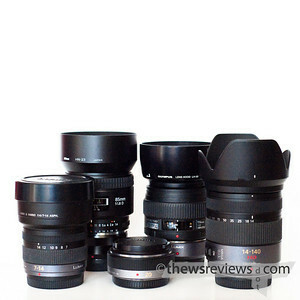 You may also be interested in the thewsreviews' illustrated collection of observations on a wide assortment of lenses: "Quick Thoughts on Lenses for Micro Four Thirds Cameras". 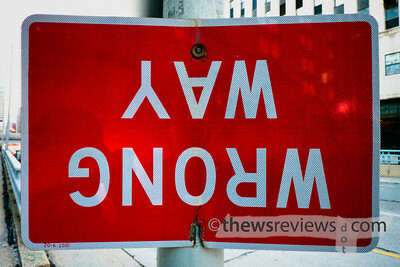 Yeah, but: It's a twofer - a review of the book and the exhibition. The Long Version: William Eggleston is one of the early greats of colour photography - the American south's version of Henri Cartier-Bresson, perhaps. While they're certainly not for everyone, Eggleston's casual and spontaneous-looking photos typically have a deeper structure and content that rewards extended viewing. (I've never really 'gotten' HC-B's images, but perhaps like William Albert Allard, I see in colour.) 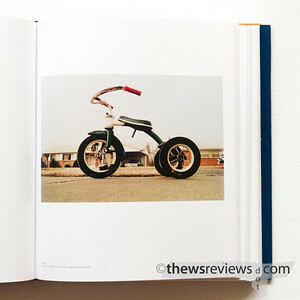 But even beyond the question of personal taste, there's no doubt that Eggleston is an important and pioneering photographer, and this collection of images that spans nearly fifty years is a fascinating study of a strongly consistent body of work. 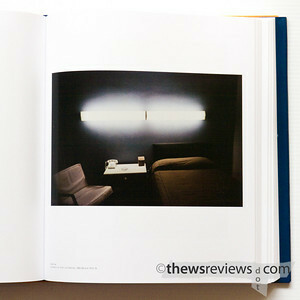 The reproductions in the book "William Eggleston: Democratic Camera" (ISBN 978-0300126211) are beautifully done, and the book is well produced. 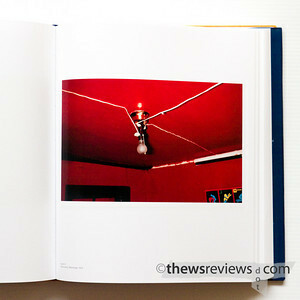 Images typically occupy only the right page, with some two-page layouts where the photographs strengthen each other. Only the occasional image is spoilt by extending across the gutter; I continue to miss the appeal of that approach, but it is a fairly common thing for photography books. Rounding out the front and back are essays and information that provides additional context for the photography. The book is a physical experience in its own right, being almost a foot tall and over an inch thick; my kitchen scale thinks that it weighs just under five pounds. 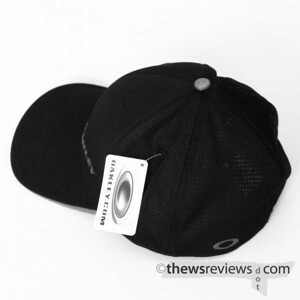 Finding it for sale might also be an experience, as Amazon in the USA and Canada are "temporarily out of stock". Currently the Canadian chain Chapers/Indigo is also sold out, and at a price that's about 50% higher. Nifty work, that. And while I'm on the subject, Amazon's Canadian sold-out price is also almost 20% higher than it was when they shipped me my copy. I'm not about to endorse the prices that some of the used vendors are asking for, but if I had paid $60 for mine, I would still think it's a good deal. It also happens to be one of the best souvenirs I could hope for. Doorway detail, taken with permission, ARTIC. Put together by the Whitney Museum of American Art - in association with Haus der Kunst, Munich - the exhibition "William Eggleston: Democratic Camera, Photographs and Video, 1961-2008" is a vast photographic collection that's currently on tour. I was lucky enough to catch it at the Art Institute of Chicago, where it's on display until May 23. Starting in November, and lasting through the start of their so-called winter, the exhibition will end its tour at the Los Angeles County Museum of Art. As good as the book is, the originals are much better. Many of the images on display use the sublime Dye Transfer printing process. The reds of this famous photograph are intense, rich and varied; blue skies are smooth and keep their colour all the way to the edge of black. 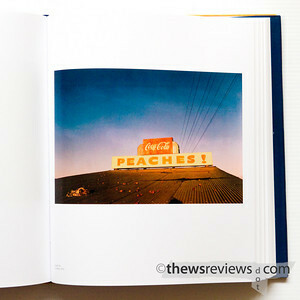 The application of this expensive and nearly extinct process to Eggleston's snapshot-like photographs of ubiquitous objects can translate into a certain gravitas; it could be the launching point for a discussion of fine-art photography and its place in the (art) world. Instead, I'll just say that it produces some amazing results, and leave it at that. 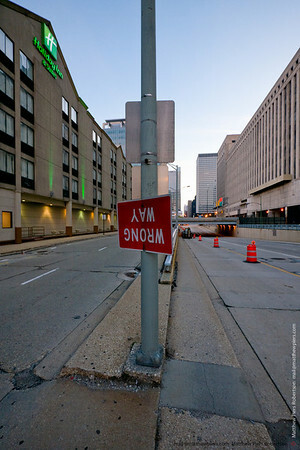 The photo reproduced above is one of my favourite images - how could it not be? - and it's also an excellent example of why seeing the book, and the original prints in the show, is so important. Mine is an absolutely horrible reproduction. Nothing looks the way it should. In the book, the sky has sophisticated colours and tones; in the dye-sub print, the sign is almost luminous with a beautiful colour harmony. This feeble copy has been demolished by its colour space and compression. It's tempting for me to pretend that what's on the screen looks like reality. Seeing good art, either in person or in quality reproductions, is worth the extra effort. 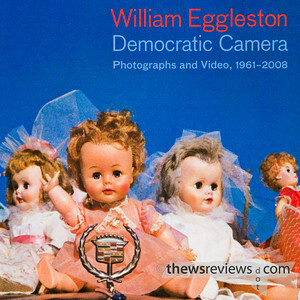 William Eggleston: Democratic Camera has been a refreshing experience. For a lively, interesting, and much better-educated discussion of the Art Institute's exhibition of William Eggleston's works, head over to The Online Photographer for the articles written by Mike Johnson and Ken Tanaka. All I can really add to their insights is that I didn't think it was that dark in there. The Long Version: In my last post - now updated with a camera bag contents photo - I was looking at my preparations for a weekend trip to Chicago. I'm writing this in the assumption that people have already seen the post below this one, which is a quirk of the blog format; click back if you haven't seen it already. In a way it's too soon to do a full retrospective on the trip, since I haven't had time to really look at the results or hear the audio, let alone actually create something out of it. But getting a finished A/V work will take many weeks, and having proper perspective on the photos will take months or even longer. Who has time for that these days? The internet is all about immediate gratification. So I've been trying to answer one simple question: if I was to do it all again next weekend, what would I change? The first shortcoming to leap out at me was a lack of reading material. I knew I'd face a four-hour layover in night-time Detroit, but my preoccupation with weight and minimalism left me with nothing to do. Normally if I find myself bookless I would surf or play games on my Blackberry, but I was trying to conserve battery power, so that wasn't a great option. I should have brought something slim to read that I could jettison once I reached Chicago. To keep me lightly entertained, it should be something full of technical details, equipment talk, and field reports, with lots of pretty but unchallenging photos - perhaps a Golfing magazine, if anyone publishes such a thing. Equipment-wise, the biggest thing that I had to learn should have been obvious: I'm not going to do anything different just because I'm somewhere else. I've used my Sony D50 audio recorder before, of course, but this time I thought I'd attach a couple of small microphones to my bag and use the wired remote to start and stop the recorder. My goal was partly stealth, but mostly spontaneity: it would keep me ready to catch interesting events thanks to the five-second pre-roll buffer. (For the record, capturing intelligible words in field recordings is a problem, not a goal, for reasons both legal and artistic.) But like Barrett Tillman said, "You won't rise to the occasion, you'll default to your level of training." My setup turned out to be too complicated and not particularly practical. I'm also not nearly good enough to be able to mix the sound from different capture devices seamlessly. Keeping it simple would have saved three-quarters of a pound and not changed my results. And while I was at it, I should have let my audio recorder run longer for each take. I had some pressure to keep moving, but it always seems like the take ends just when something interesting is about to happen. I brought out my little Manfrotto 345 tripod only a couple of times. Once was for recording audio, and the other was for some video clips. Next time I probably wouldn't bring a tripod at all, and just make do with impromptu supports whenever possible. I'm not convinced that I'll ever be good enough to capture stills, footage, and audio in a single day, since each has a different language and needs a different mental space. Even combining stills and audio have conflicting-enough requirements that I've never managed to do both well at the same time; I'd love to hear Keith's thoughts on this. I used my Colorchecker a few times while I was wandering around the city, but since the profiling software doesn't work with the GH1's distortion-correcting DNG files (lenses via adapters create profiles with no difficulty), it was strictly a white-balance reference. I could have used a smaller piece of my cardboard grey card, but the legitimate opportunity to take a photo of a Rothko painting demanded the most reliable colour balance I could get. 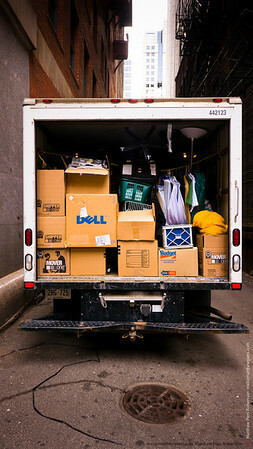 While I wish I could have used my heavy iron, the GH1 with the bright 20mm f/1.7 did quite well, letting me accomplish a major goal for the trip. Another of my goals for Chicago was to take photos for reviews of the Panasonic 7-14 and 20/1.7, so I was making an effort to use those two lenses. 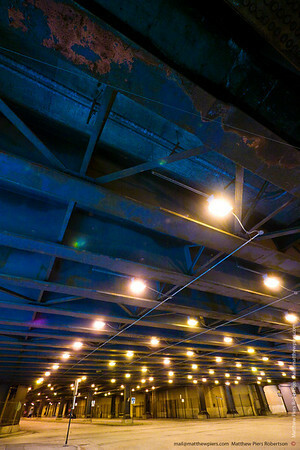 Even still, I was surprised at how rarely I used the 14-140, and it contributed only about 10% of the total images. While a few of its photos used the middle of the zoom range, most were either at the long end of its reach - where it's weakest - or were reasonably close to 14mm or 20mm. I was ambivalent about bringing it with me, and if I was to do it again next weekend, I'm still not sure if I'd tuck it in my bag. At one point I wished that I had my PC-Nikkor 35/2.8 shift lens, which would make an interesting substitution for the superzoom. Perhaps that's what I'll do next time. Over the course of the trip, I used three batteries for the GH1. I exhausted the first one, and then switched the second prematurely, which is the opposite of how I usually work. I had marked my fresh batteries with a strip of electrical tape over the contacts, with a flap folded over for easy removal. One set of batteries was ample for my audio recorder, which was what I expected, and I even used my ND filter on the 20/1.7 for some photos and video. So while there are a few things that I could have done without, I did use everything I brought with the exception of a few spare SD cards. Not too shabby. 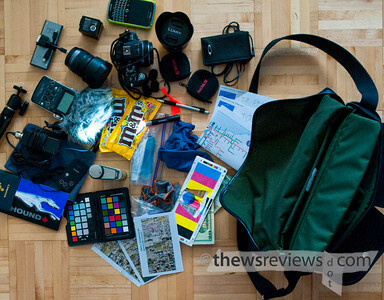 At just 9.5 pounds, my camera bag wasn't my enemy. Leaving out the easy stuff - microphone, tripod - would bring it down even more. The Hadley Pro bag itself was as flawless as its slightly overstuffed condition would let it be, and I finally came to appreciate the zippered back pocket for holding my passport, tickets, and maps. It's a good traveling companion, and since I always keep my camera bag with me, its compactness and discreetness was a real strength. It's going to be great for carrying around New York this fall. Overall, I have to say that the trip was a huge success. 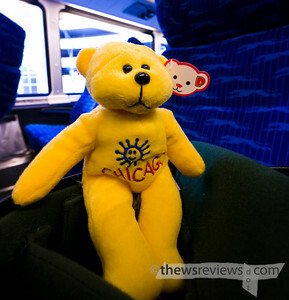 Almost everything went the way I expected it to, and the Chicago excursion was a much more positive experience than my trip to Ottawa even though it lasted twice as long. I nearly filled a 16GB card, and captured almost a gigabyte of audio recordings as well. Even allowing for my vanishingly low 'keeper' rate, there's almost certainly something decent in there. 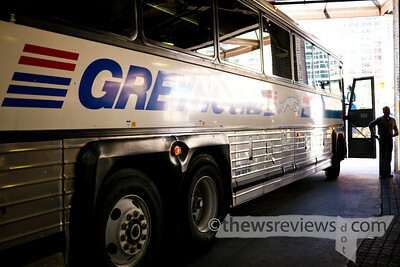 None of the equipment failed or ran out of power, nothing limited my shooting, and my travel itinerary worked well. 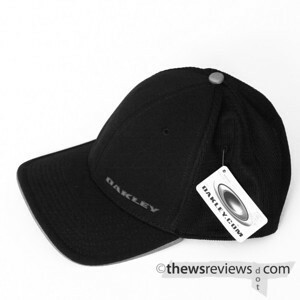 In fact, the only negative from the whole weekend was that someone stole my hat when I was in Detroit. I was using it to mark my place in line, and the Windsor-Toronto route boards from the gate next to the payphones. I can't say I was surprised - it was a nice hat - but since I bought it for the trip I suppose it's fitting that it remained behind. I'm still going to buy another one, though. The Long Version: I really like the idea of road trips. There's a long tradition of photographers getting into cars and driving all over America just to see what they could see. There's Robert Frank, Steven Shore, and William Eggleston, to name just a few. But I'm a working photographer - at a day job, like the vast majority of us - and I can't just head down the road to places unknown for as long as it takes me to get there. And even if I could wander for months, I have a family that I'm not willing to leave; there's also the practical matter of my never learning how to drive. So instead I take the bus, and go for the weekend. 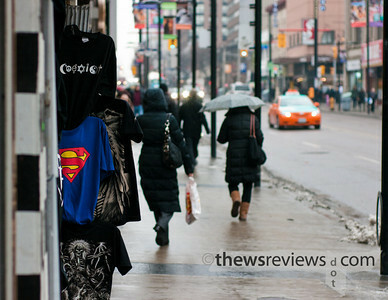 Last fall, I did a 24-hour round trip to Ottawa, which is about six hours away from Toronto. That was a test run, like doing a 5K before attempting a marathon, and now I'm using what I've learned to prepare for my next endeavor. 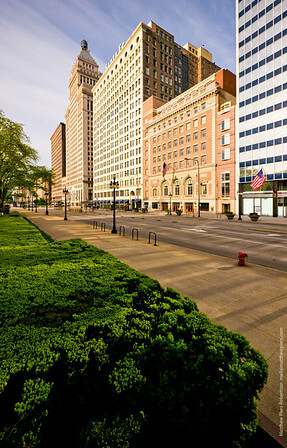 This weekend will be the true challenge: sixteen hours to Chicago, incoporating a 4 hour layover in beautiful late-night Detroit, nineteen hours in the city, and then back on the bus for twelve hours to get home. 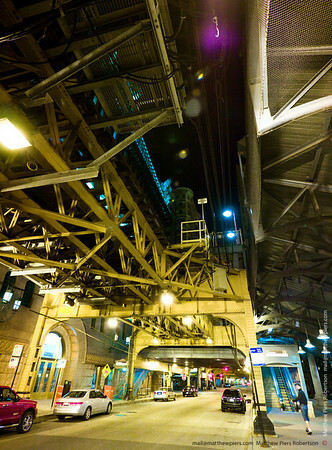 While I'm there, I want to ride the "L", take an architectural tour or two, and visit the Rothko painting and William Eggleston exhibition at the Art Institute. And, needless to say, I want to take a lot of photos, capture some video, and record enough audio to create a couple of A/V works from my time there. Hit the ground running way too early in the morning after a lousy night spent barely sleeping in a cramped and uncomfortable seat. Spend the day trying to make the best use of my time without having a clear objective or knowing enough to make informed choices. Plunge into a situation where I need to perform without knowing what tools I'll really need, and having to carry everything with me all the time. What's not to like? 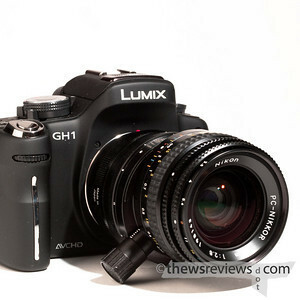 • Camera: Panasonic GH1, 7-14, 14-140, and 20mm lenses. Several extra batteries and 32GB of memory cards. 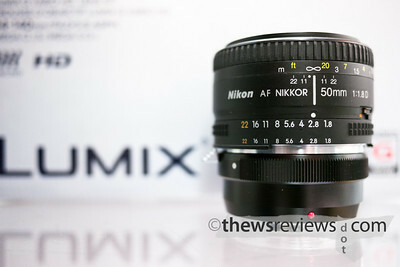 A 46mm ND filter for the 20mm lens. 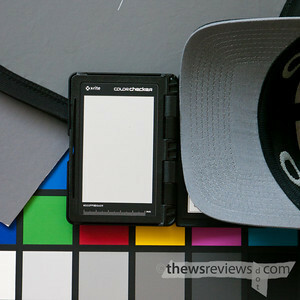 Manfrotto 345 tripod, Colorchecker Passport. • Audio: Sony PCM-D50, Rode windscreen. Giant Squid powered omnidirectional stereo microphone. RM-PCM1 wired remote. • Extras: Leatherman S2 flashlight, Blackberry, iPod Classic, Fuelcell booster battery, and earphones that will also be used with the audio recorder. Maps printed on 4x6 photo paper with interesting addresses on the reverse. My skinny new Mighty Wallet. Peanut M&Ms, and 8oz Stanley flask for water. • All of this will fit in my Billingham Hadley Pro, which is small enough that it won't need to be checked at the art gallery. So that's where I stand right now, thirty-eight hours before I leave - or eighty-five hours before I'm back. Ten of my named items have already been written up; I'll be using four different things that I expect to write reviews for. 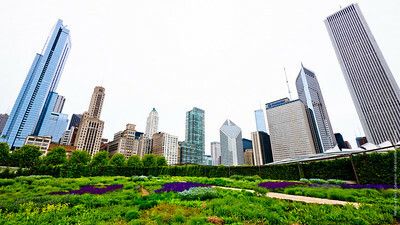 Chicago will be the proving ground for my Panasonic 7-14mm lens, like Ottawa was for my Nikon 105VR, and I'm also hoping to review some of what I see while I'm there. And as soon as the travel trauma wears off, I'll be writing a 'what worked' recap of my trip to give a general overview of what I discovered about the concept and execution of the entire weekend. Yeah, but: It's the Swatch of wallets. The Long Version: It looks like paper, but it's actually the indestructible stuff used to make things like ultra-strong envelopes and the white clean-room suits that Apple once mocked. Dynomighty is a New York designer take who has taken advantage of Tyvek's printability and used it to create a thin, lightweight wallet with a huge range of graphics. School notebooks, original art, comic books, the first three thousand digits of Pi, or even solid colours and a blank page - there's something for everyone. And like Swatch watches, they're cheap enough that being whimsical won't leave your new wallet empty. I've already bought three of them, and am looking for a couple more. The material itself is smooth and soft with a slight grain; it almost feels a little bit like leather. While it can be cut, it's essentially impossible to tear, so wear from daily use isn't much of an issue. While it is possible to write on Tyvek, not all pens will work properly, so try it out in an inconspicuous part first. Because the wallet is made by folding a single sheet of material, it's easy to open the flaps that hold it together for a great test surface. I've added an address to my Airmail wallet just to give it that extra bit of authenticity. The Mighty Wallets have two pockets for bills, with a section in between that they suggest using as a quick-access business card holder. While I suspect that they're just turning a bug into a feature, it does work well and is reasonably secure. Just don't push them in too far, or they'll get bent where the wallet folds, and be careful not to point the pockets at the ground. The inside face has two cut compartments for plastic cards; enough for some people, but compulsive store-points collectors and gift-card users will want to look elsewhere. Credit card, bank card, brand-new drivers license, and my health card - for American readers, that's the one that means I never have to worry about how much it costs if I get sick - all ride up front in these secure inward-opening slots. 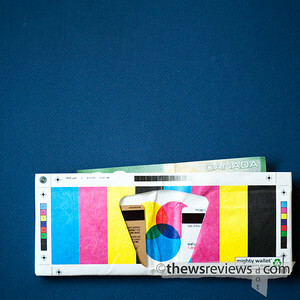 Extra business cards, video store card, and the like normally go in one of the two bill pockets. At first that's all I thought I'd use the redundant pocket for, but it does come in handy for keeping a set amount aside, or for carrying two different currencies. 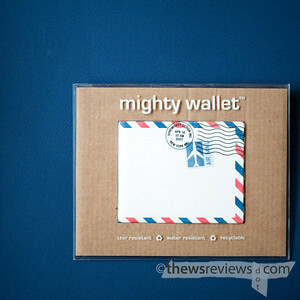 One of the great practical aspects of the Mighty Wallet is how easy it is to carry. In addition to weighing almost nothing, it's incredibly thin. 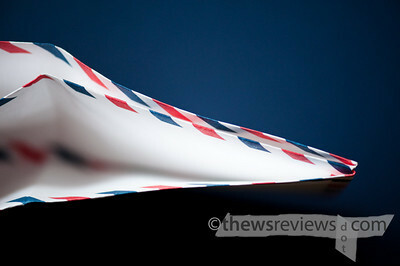 After all, it's essentially plasticized paper, and its folded construction is only nine layers thick. The way it's put together is very clever, using only a small amount of glue, and while it's possible to unfold it (and see how it's made) it's secure enough for real-world use. And speaking of security, there's a certain anti-theft appeal of having a wallet that looks like an envelope, a scrap of paper, or a transit map. The counterpoint is that I'll have to be careful not to throw it out during my semi-annual desk clearing: TANSTAAFL. When full of everything that I like to carry, the Mighty Wallet is still only as thick as my old leather wallet is when it's empty. 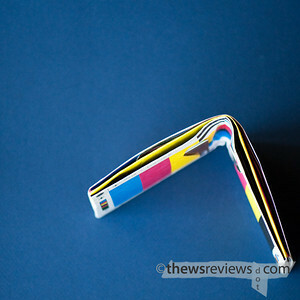 They're cheap, easy to carry, fun, and can start up a conversation with the cashier. What can be better than that? Even after buying my third - after this review was originally written - I still find myself browsing Dynomighty's designs and being tempted by many of them. While I still have my standard-issue black leather wallet kicking around somewhere, I never really expect to use it again. Yeah, but: It's for water, officer, honest. The Long Version: Stanley's Classic Flask (manf) is an 8oz container that will hold whatever you want, as long as it's pourable. It has a slightly triangular profile with generously rounded corners, making it easy to carry in a pocket and less conspicuous than the traditional curved hip flask. Its darker colour also helps lower its visual profile, although I doubt that anyone who sees it will be fooled. Overall the look is almost retro, and for some reason it vaguely reminds me of a miniature metal gasoline can. My first impression when I picked up the flask is that it's slightly flimsy; I'm used to the thick metal-walled cylinder of my Kleen Kanteen bottles, which could serve as an impromptu weapon. It's not that the Stanley flask is badly built, it's just that the straight sides can flex in ways that I'm not used to. The mouth is nicely machined, and the plastic cap is chromed and held in place by a plastic arm. Not being able to lose the cap is a nice touch, and while the plastic doesn't exactly scream reliability, I'll wait until there's actually a problem before I complain about one. But the overall 'cheap' feeling isn't helped by the name badge and "Eddie Bauer" stickers - guess where I bought mine - which seem ready to peel off and weren't placed properly on one of the others in the store. Them peeling off won't be a loss when it happens, but nothing says 'poser' to me quite like an Eddie Bauer edition of something, which is actually the impression that I'm trying to cultivate. 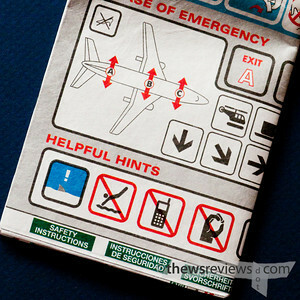 I spent a lot of time looking for a small, slim water bottle that I could fit in the pocket of my favourite camera bag. 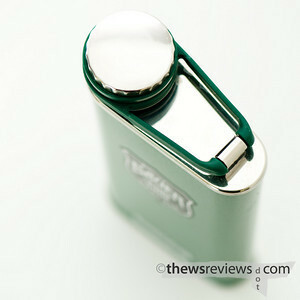 That turned out to be far more difficult than I expected, so option 'B' was to find an innocent-looking flask. That also turned out to be nearly impossible, but the REI website showed the classic Stanley, and sometimes close enough is good enough. With an 8oz capacity - about 250ml - it's not about to replace a canteen for desert treks, but it's enough to carry in the city in case there's a shortage of water fountains. Alternatively, it can hold the rest of one of those evil plastic convenience-store bottles without needing to take up a tall round space in my camera bag. One of the big questions about stainless steel bottles is whether or not they 'taint' the beverage with a metallic taste. For the Stanley flask, I did an experiment. I left it filled in the fridge for twenty-four hours, and then poured its contents into a glass. In an identical glass, I poured the same amount of water straight from my Brita filter. I kept track of which was which, but asked Penny to check and see if she could taste any difference between them. Then she switched their positions while I wasn't looking, and I tried to distinguish which one came from the steel flask. We both agreed: no difference at all. 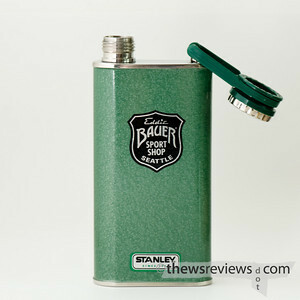 The Stanley Classic flask is designed for use and economy, and light weight and a reasonable price is more important to me than any potential heirloom status. It does what I want it to, and if it lasts me a couple of years of occasional use, I'll be satisfied. I'm not going to wait until I'm the centre of attention before I take a swig from it, but I've never been fond of drawing attention to myself. I'll just sit and drink in the shadows instead. The Long Version: My favourite client, The Polished Penny, has recently opened a shop on Etsy. For those unfamiliar with the site, it's a marketplace for all sorts of things handmade. It has occasionally been compared to eBay without the auction clock, but I think of it as the Flickr of product photography. 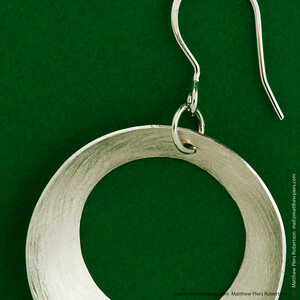 Penny specializes in silver earrings and pendants; as a photographer, I'm always impressed by her ability to create something entirely from raw materials. The photography that I've done for The Polished Penny spans a healthy range of time and techniques. The image above was shot with a D700 and strobes, which lets me keep decent depth of field while working hand-held for a variety of angles and options. Other times I'll work with natural light with the camera on a tripod, typically with my GH1 for the greater convenience of the flip-out screen. There'll always be more jewellery and more photos, so check it out from time to time.